Avant browser is one of the safest and most well-known web browsers available on the market, and now with Portable Avant Browser, you can take that level of safety with you everywhere you go. The interface is simplistic and clean, you can manage multiple accounts, and you can completely customize the browser to suit your unique and individual needs. Portable Avant Browser also comes equipped with a built in popup stopper, flash ad filter, and even a cleaner which help to make it one of the fastest web browsers out there. - Completely portable – Simple put the executable onto a USB stick or Flash drive and take it with you wherever you go. - Will not affect your Windows Registry in any way whatsoever. - Lets you save web pages as HTML. - Comes equipped with support for multiple accounts. - Gives you the ability to enable/disable toolbars. - Allows you to choose between different views (full screen, full desktop, split view). - Gives you the ability to organize and password protect your AutoFill. - Allows you to customize the browser to suit your unique individual needs. - Blocks unwanted popup pages. - Gives you the opportunity to disable pictures, videos, sounds, and scripts. - Equipped to support proxy servers. - A powerful and fast web browsing experience without any strain on your system’s resources. What a brilliantly quick browser,looks very good too.Was dubious at first after trying all the bigger named browsers,but am surprised,not used IE8 since downloading Avant 2010-101. Would highly reccomend anyone who finds IE8 too slow. I use every feature of avant to the fullest. I have about 15 different quick searches and about 30 url aliases. This was the main feature that got me using avant, in addition to very quick new-tab opening. he other huge thing I liked was that if I ever installed a new OS my avant online account remained intact and the browser and bookmarks and settings remained exactly the same on all of my systems. A most terrific Web Browser. This browser is an up and coming browser but it has come a long way. I've followed this browser for a few years now and always keep it on my desktop to use if I've ever gotten bored with Firefox or just wanted to use something different. I really love this browser and just downloaded the newest version that was released December 2009, haven't used it or the last version or 2 in the past 4-8 months. But I was very satisfied with Avant when I did use it. Avant is just as good as Firefox and could be even better if the developers continued to shoot over the top!! Avant gets 5 Stars!!! 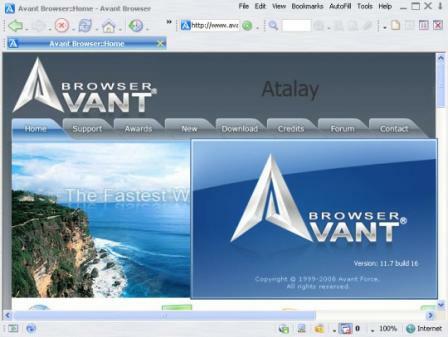 AVANT has ALWAYS been one of my TOP 2 FAVORITE BROWSERS!! fast and easy to use,reguallay update with bugs fixed and new function.